Can you fall in love with a desk? YES, YOU CAN! The Hansen Family Desk makes me gasp! I really love it! I want their coffee table! Nice, but hardly an original design — it’s basically a rustic version of the classic Herman Miller Nelson Swag Leg Desk (http://www.hermanmiller.com/Products/Nelson-Swag-Leg-Desk-and-Tables). o that print on the wall is fantastic too! anyone know where it’s from? gosh! and the lovely color of walls! Anybody? I feel a bit depress looking at this table…, maybe reminds me old stuff. @Kate: They’re Eames Plastic Chairs. I just wrote them, asking for a price, and it really is a family business – waiting for the designers mom to reply with a price list. I love this. How far is NY from reality? Yes, definitely inspired by the Nelson Swag Leg, but in kicks the pants off of it in my opinion. This looks fresh whereas the Swag Leg is showing its age. The poster subject is the Ettore Sottsass: Valentine typewriter for Olivetti, 1969.
great chair, anyone knows where i can get one? 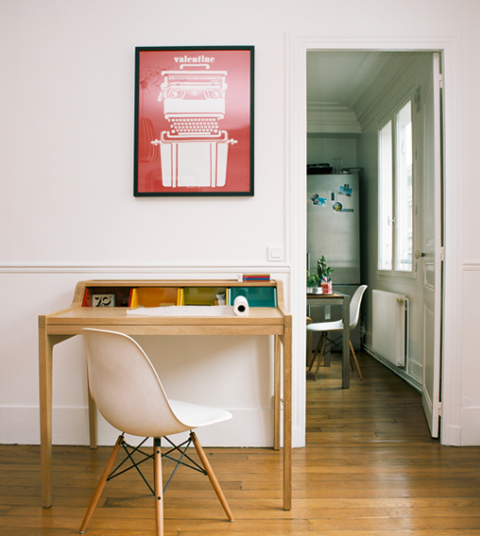 The print on the wall is an Olivetti Valentine Typewriter Print designed by Ettore Sottsass. The chair is a Eames Plastic Chair DSW. May be you can find some resellers on those websites. @ Alex : thank you for your post. My table is strongly inspired by George Nelson but if you have a closer look to it, it’s pretty different. I mixed the traditional danish woodworking with the use of 50’s colours. The form is almost a classic desk from the fifties, created by Pierre Paulin, George Nelson etc. ; whats new is that its cases go deeper, you can take out the cases and open it from above. But it’s really a homage to George Nelson, that’s why our collection is called Remix. The poster by Ettore Sottsass is available from the Design Museum Shop in London. The chairs are Eames plastic side chairs (DSW with maple legs), manufactured by Vitra. Lovely too. I have looked for a while for retailer information for this desk, anyone know who carries their stuff in the United States? I’m curious to discover out what blog system you are utilizing? I’m having some small security issues with my latest internet site and I would like to locate something a lot more risk-free. Do you have any recommendations?